Denver Mayor Michael Hancock and Denver Art Museum Director Christoph Heinrich announced the Free for Kids program at the Denver Art Museum on March 25, 2015. 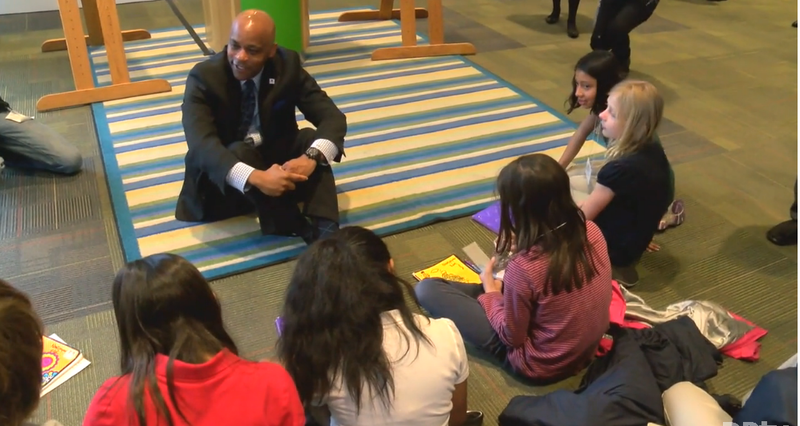 Denver Mayor Michael Hancock speaks with local students at the Denver Art Museum. The program provides free general admission to visitors ages 18 and younger, making the world of art accessible for all kids from all backgrounds. The Free for Kids program is funded by two donations: a one-year grant from Kaiser Permanente Colorado and a five-year gift from longtime DAM board member and Reiman Foundation President, Scott Reiman. The program is directly aligned with the Reiman Foundation’s mission to fuel creativity, imagination and learning among Colorado’s youth. Read more about Scott Reiman’s donation in a story from 5280 Magazine.